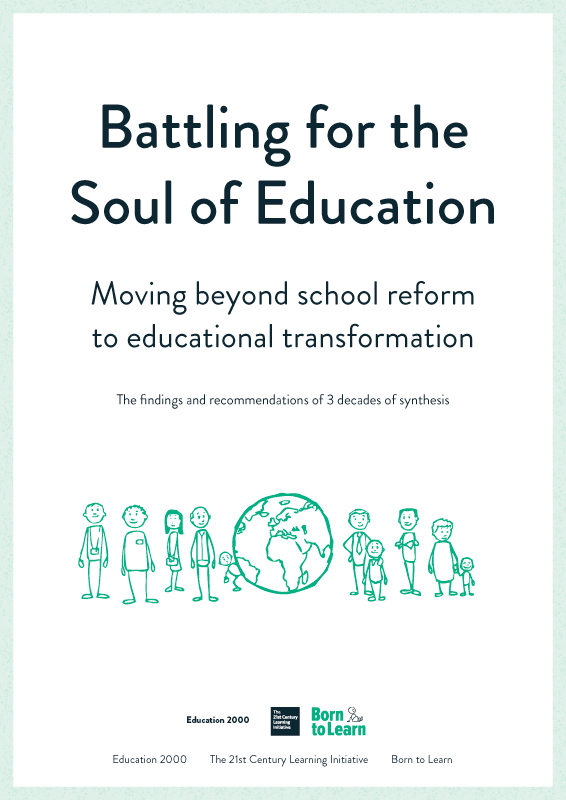 Immediately, this Synthesis would suggest that by contemporary schooling continuing to emphasize the assumption of the classical curriculum (with the dominance ascribed to the role of the teacher to instruct, and of the separation of thinking from doing) and the belief that education is pre-eminently an institutional activity, it is actually schooling which is exacerbating the difficulties society experiences with its young people, rather than in any sense alleviating the problem. From the findings of cognitive apprenticeship it would seem that a model of learning is needed which gives every support possible to the youngest learners, both supporting the needs of the child, and actively supporting those adults who can provide informal support and encouragement that formal arrangements can never provide. Thus as children grow older and tales ever more responsibility for its own learning, this process would seem to match exactly what is now being discovered about the progression of neurological change in both the youngest, and the adolescent, brains. Formal education will inevitably have to question the present nature of the curriculum, and consider that much work must now be undertaken in a “Humankind Curriculum” that would help individuals to better appreciate how they can help themselves to grow up, and make appropriate contributions to the community. It would seem that the statement of 1931 was simply repeating what every self-respecting craftsman of years gone by knew had to be the evolving relationship between himself and each of his apprentices. People learn through constantly facing challenges somewhat beyond what they think are within their reach. The strategies humans apply to do this have been shaped, quite literally, through millions of years of fine adaptations to learning collaboratively, on-the-job, to the solution of real problems. Secondary schools have existed for only about two hundred years, and reflect a Behaviorist’s philosophy of learning which is now seen as being inaccurate, inappropriate and incomplete. If today’s secondary schools are then the wrong places for the descendants of brilliant stone age thinkers to thrive in, then society as a whole (and certainly not simply schools on their own) has to rethink how to use the creative energy of adolescence to the overall good of the community. Youngsters who are empowered as adolescents to take charge of their own futures will make better citizens in the future than did so many of their parents and their grandparents who suffered from being over-schooled, but under-educated in their own generations.